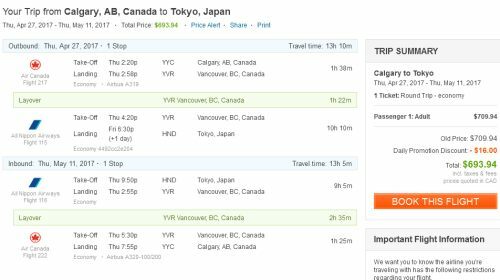 All Nippon Airways (ANA) is currently showing flights from Calgary to Tokyo, Japan for just $688 CAD roundtrip including taxes. It's notable that such a large range of dates are available, from late August 2016 summer travel right through to nearly the middle of May 2017. 4. 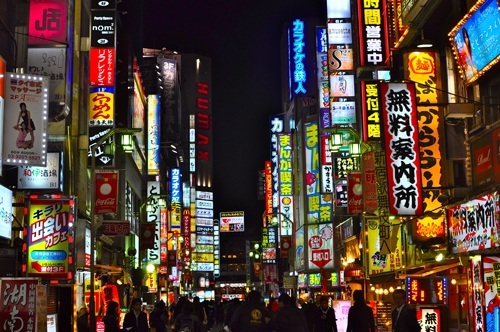 Search for a flight from Calgary (YYC) to Tokyo (HND) using the same dates as you found above. You may have noticed that Google Flights only shows dates up to about mid April 2017. And Flight Network's calendar only allows you to select dates up to about this point as well. 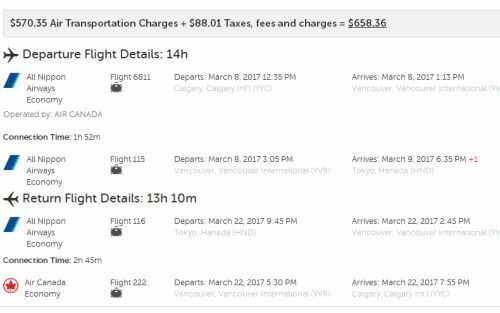 UPDATE 5/22 - You may also want to try searching on ITravel2000 who is now showing these for $658 CAD roundtrip including taxes. 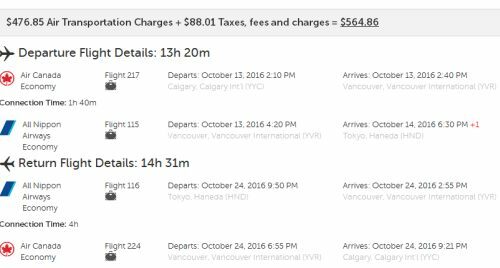 Update 5/24 @ 5:45 PM MST - Incredibly, the Calgary - Tokyo flights have now dropped to $557 CAD roundtrip including taxes! Also note that while ITravel2000's calendar only allows you to select dates up to April 19, 2017 you can find late April and early May 2017 flights on FlightHub for $594 CAD roundtrip including taxes. For more details, scroll up to the paragraph titled 'Booking dates in April and May 2017' . Reminder: If you booked these flights a few days ago on Flight Network when they were $688 CAD roundtrip, you may qualify for their price drop protection credit. - Look for the cheaper date combinations that are $637 to $700 CAD roundtrip. Click through from Momondo to whichever booking site is showing the cheap price. 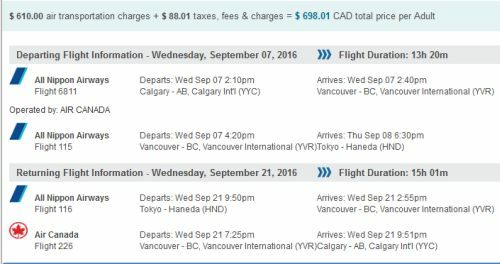 5 Responses to "Calgary to Tokyo, Japan - $557 CAD roundtrip including taxes | August 2016 through to May 2017 !" You just need to click on the Alerts menu at the top of the website. Also cheap flights to Sapporo, for skiing. I think the deals are off. Prices just went up about 300-400 dollars now. Deals are working at this time. I've been trying dates in mid Jan to mid Feb and they are coming up as $1300/person.